The Evesham limestone fireplace is the perfect centrepiece for any room in your home thanks to its classic design and brick chamber. This fireplace features a hearth made of slabbed Italian granite, and there is the option of two different kinds of chambers. Choose from either the contrasting brick chamber or the complimenting limestone chamber. 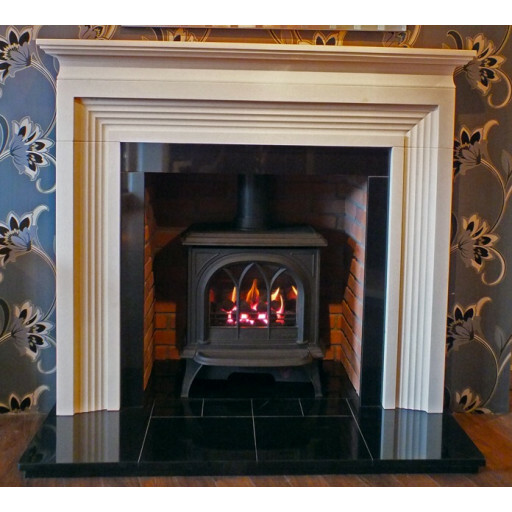 The Evesham limestone fireplace has a classic tiered design with a stepped interior. The double height mantle helps bring out its definition to make it the perfect addition to the decor of any home. The fireplace can accommodate all heating applications, be it gas, electric, or solid fuel.The overall height of the Evesham limestone fireplace chamber measures in at 1,300 mm, with the interior size 760 mm in width and 820 mm in height. The base measures 1,380 mm in length and just out to 460 mm. The mantle comes to 1,420 mm in length and comes out to 195 mm, providing room for family photographs and other decorations. Because the fireplace is made from only the highest quality materials, it is not only visually stunning but durable too.